Catch That Theory: Marilyn & The Mob? 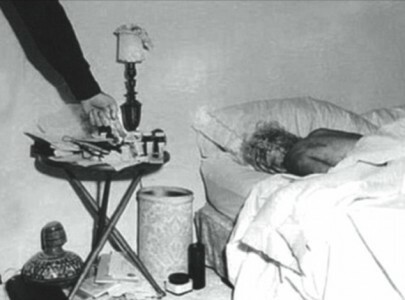 Check out this scandalous theory surrounding the mysterious death of Marilyn Monroe. Was she murdered? Disgusting! How could someone do this to an elder is beyond me. What’s even more sick is that after he pushed the 91 year old man down resulting in multiple fractures and head injuries, he then tried to push a second man but the man was quicker on his feet and didn’t flinch, instead lunging towards the attacker and putting hands on him. He needs to be put away for good. He is a danger, threat and terrorist. Thoughts? Paul Crossley, 46, has been convicted of attempted murder after shoving a 91-year-old man onto train tracks on the London Underground. Words were exchanged between coaches, one parent told WCYB. That parent also provided video of the incident between the teams from Dickenson County’s Ridgeview area and Wise County. Punches were thrown, while some of the kids, who appear to be in elementary school, attempted to break things up. One adult threw another to the ground. There were no injuries and no arrests. FOX 5 SAN DIEGO — Dyteon Simpson has been arrested in the shooting death of Louisiana State University basketball player Wayde Sims. Simpson was taken into custody Saturday morning after admitting to shooting Sims shortly after midnight Friday. The 20-year-old athlete suffered a gunshot wound to the head after intervening in an altercation between his friend and Simpson, also 20. What in the ratchet a** baby mama/daddy drama hell is going on here? I feel so sorry for that baby. No child deserves this kind of introduction into life. I always knew Bruno had the hits but this guy took it literally! For some reason the song blame it on the a-a-a-a-ALCOHOL comes to mind. FOX 5 SAN DIEGO — An Indiana man was arrested for battery and criminal recklessness after an argument over whether a song was by Bruno Mars led to him hitting a friend in the face with a pistol and the weapon firing. Roger [Last Name Withheld], 71, was charged with battery with injury and criminal recklessness with a deadly weapon, both Level 6 felonies. According to a Johnson County Sheriff’s Department report, Roger and two other friends broke out in an argument late Friday night over whether a song was performed by Bruno Mars. The victim said Washburn then pulled out a .38 revolver and struck him in the forearm and right cheek. The revolver reportedly went off when it made contact with the victim’s face, but no one was hit. The victim left and reported the incident to police a few hours later. According to the police report, the victim had “a small gouge on his right cheek, blood on his pants, shirt and a red abrasion on his right forearm.” The victim did not seek medical attention. When confronted by police, Roger allegedly admitted to striking his friend with the pistol after the argument over the unknown song. Hustlers, what would you have done?